God never changes. That can be difficult for mankind to understand since we are ruled by our emotions and they often betray us. However, just like us, God has emotions but they do not rule Him. We all react to the environment around us and our responses vary from muted to violent eruptions, but even when a response is outwardly muted, that does not mean everything is calm inside. The trend is to control your emotions and make sure that you do not antagonize other people. We don’t do this because we like them, but because our behavior can affect us in a positive or negative manner. When it comes to God, there often is no consideration that we might be grieving the Lord or what He wants from us. God can be jealous and angry but it is always directed at those who rebel. The Lord is merciful and wants to be joyful. 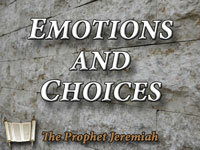 The Book of Jeremiah is a rich source for how God thinks and what He desires of us. He wanted a commitment from the people of Judah, for them to repent and remove the sinful lifestyle, but that was not to be the case. They just wanted God’s blessing but they had no desire to please Him.